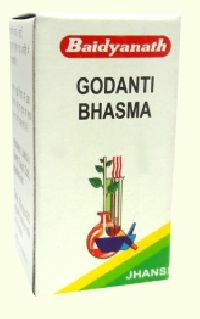 Godanti bhasma is ayurvedic mineral preparation of gypsum. 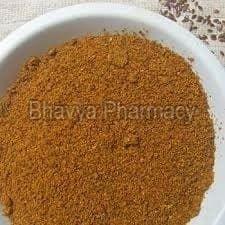 It is natural form of calcium and can be used for stronger bones and teeth. 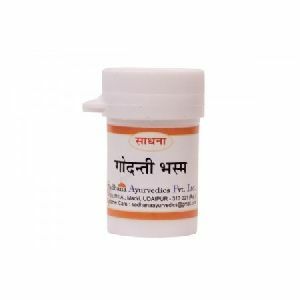 We are manufacturer of abhrak bhasma , akik bhasma , godanti bhasma , kapard bhasma , kasis bhasma , loh bhasma , mandur bhasma , muktashukti bhasma , nag bhasma , praval bhasma , sankh bhasma , tamra bhasma, trivang bhasma , vang bhasma, vaikrant bhasma, yashad bhasma etc..according to your leading demand on optimum prices.. It is used in the treatment of leucorrhoea, Fever due to Pitta imbalance, Chronic fever, cough, cold, asthma, anemia, chest injury, emaciation and wasting in children. Indication: Fever, cold, cough, headache, typhoid, malaria and pneumonia. Dose: 120 to 240 mg twice daily or as directed by the Physician. 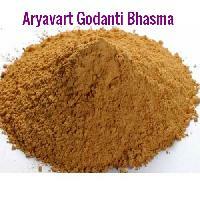 Active Ingredients: Hartal Godanti (Purified), Extract of Chandan, Gulab, Kewda, Kamal ke Phool, etc. 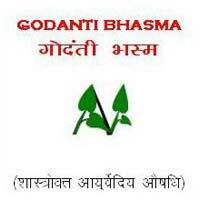 as per text. Reference: Siddha Yog Sangrah.